Approximately 30 days before Ash Wednesday, the sleeping masses awake on a Saturday afternoon from about 2:00 pm. Natives flock to the streets of the island’s capital, Roseau, to observe and at the same time wet their taste buds for a feast, anyone, anywhere in the world should travel for. What used to be a dull slow moving town quickens in pace and becomes vibrant with colour. This awakening of masses and town is known locally as Opening of Carnival City or just ‘Opening’ as the locals call it. A parade of floats, contestants for various competitions, costumes bands, flag-wavers and small groups from the private sector seeking a good advertising medium glides through the streets of the town and into the Carnival City. There speeches are given with much excitement. These long speeches, on other circumstances would evoke feelings of irritation at what may seem to be an ADHD suffering people serve only to rouse further excitement from the people at this point as they await what they expect to be the best carnival year ever. Each group puts on brief displays, to appease the taste buds of the salivating carnival fans. Similar openings are held in Portsmouth, the second town and other small communities. And so the season kicks off into high gear of competitions, all leading to the climax. The Princess show is one of the first events held for the festive season. Girls, usually between the ages 8 to 11 represent their schools and compete for the title of Miss Carnival Princess. This competition is followed by the junior monarch competition. In the junior monarch, young people from primary, secondary and tertiary schools meet on stage and let their voices be heard through song, as they point out the glaring defects of the society. The Teenage Pageant is another element of the carnival celebrations. Here young ladies from the island’s secondary schools vie for the title of Miss Carnival Teen. The National Queen Show is one of the season’s highlights. Young ladies ages 18 and over meet on stage the evening of the last Friday before Carnival. This show draws spectators from every square inch of the island. All seem still as the competitors meticulously go through each round of the competition, attempting to avoid inevitable errors lest they become prey to the error seeking predators. The crowning of the winner of this competition receives the title of Miss Dominica, and is ambassador to her country during her one year reign. 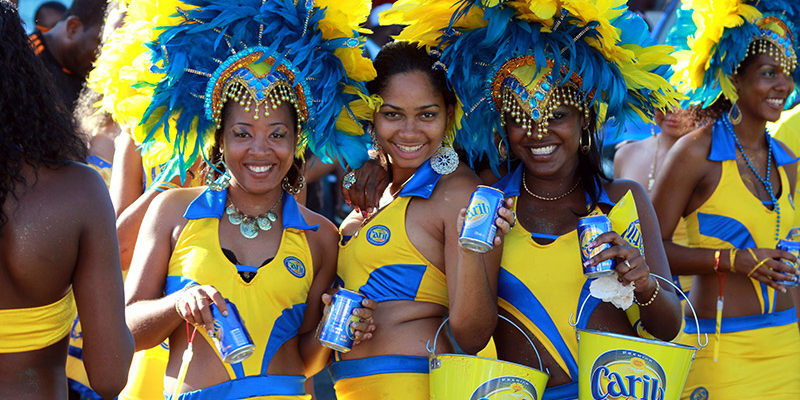 The greatest of all the competitions is the Calypso competition which is held the night of the Saturday before carnival. Prior to this competition, each week, calypsonians compete in various small competitions such as stardom tent, king of the camp, queen of queens among others. The last competition is known as Calypso Finals, which consists of calypsonians who made it past the semi-finals. This competition is the island’s most attended show. Everyone attends and is ready to shake to the rhythms as the performers set the stage on fire fuelled by criticism of the island’s leaders, organizations and other social issues. The sarcasm, cynicism and ridicule expressed through song, is matched by equally witty dramatic presentations, which usually results in bursts of laughter and approval by the spectators. The crowning of calypso king or queen at the end of the night leaves islanders either greatly elated or disgruntled as they leave the park in great pandemonium. Also see : Carnival Monday and Carnival Tuesday activities.